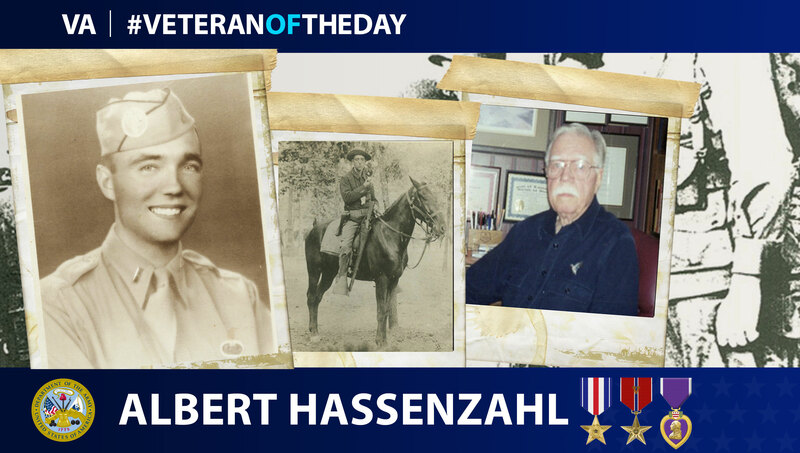 Today’s #VeteranOfTheDay is Army Veteran Albert M. Hassenzahl. Albert served from 1942 to 1945 in the European theater during World War II. Albert was born in Toledo, Ohio in 1921. Albert enlisted in the Army in 1942 following the attack on Pearl Harbor. He completed basic training at Camp Livingston, Louisiana. Shortly thereafter, he graduated from Fort Benning, Georgia as an officer with the rank of captain. He was assigned to C Company of the 1st Battalion. Albert was sent to England in 1943, where he continued training, now as a member of the 506th Parachute Infantry Regiment, 101st Airborne Division. In the early morning of June 6, 1944, Albert departed England for Normandy, France. He was one of the first paratroopers to drop behind enemy lines as part of the D-Day invasion. On June 8, Albert was wounded in a firefight, receiving a bullet wound to his right side. Albert was promptly transported back to Omaha Beach and evacuated to England for medical treatment. Albert recovered quickly and rejoined his company in Holland later in the summer. He once again parachuted into battle during Operation Market Garden. During this operation, Albert took part in other small missions rescuing Allied troops from Nazi territory on the east side of the Rhine River. Albert also fought in the Battle of the Bulge. As Albert’s company moved into Germany, they took control of the Landsberg prison, liberating Jewish and Polish prisoners being held. Albert was one of the first Allied soldiers to enter Hitler’s “Eagle Nest” in the south German town of Berchtesgaden in the spring of 1945. For his service, Albert received the Arrowhead Device for his actions on D-Day, as well as four Purple Hearts, a Silver Star, Bronze Stars for Valor and the Presidential Unit Citation. In 1994, Albert and some friends took a road trip across Europe, visiting the battle sites he fought at during the war. In June 2009, Albert passed away at the age of 88 in his hometown of Toledo. We honor the service of WWII Army Veteran Albert M. Hassenzahl.